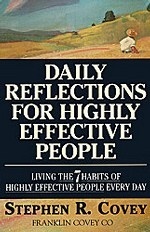 Аннотация к книге "Daily Reflections for Hightly Effective People"
Make the 7 habits a part of your life - every Stephen R. Covey has helped millions of readers attain professional success and personal fulfillment. With penetrating insight Dr. Covey reveals a pathway for living with fairness, integrity, honesty, and human dignity - principles that give us the security to adapt to change and the wisdom and power to take advantage of the opportunities that change creates. Now, as a succinct introduction to Dr. Covey`s revolutionary thinking or as a reminder of key principles, "Daily Reflections for Highly Effective People" provides an inspirational recharge that will bring you closer to a holistic sense of personal effectiveness and purpose.